Summer time and children of all ages are off to go to camp. Summer camp games involve campers and their counselors in activities designed to provide physical exercise; help build leadership skills, independence, and self-esteem; and are fun! Leaders, facilitators, and/or counselors should participate with the campers and enjoy themselves. Just make they play at the same skill level as the campers to avoid having an unfair or unsafe game. Make sure all players have an equal opportunity for success. Rotate leaders, captains, and team composition as needed to provide a quality playing time for all participants. Remember that keeping score is not always important. Some games are more fun if there is not an emphasis on winning or losing, but simply having fun and staying active. Try reinventing activities by changing rules to adapt them to the age and ability level of players. Additionally, a game can be adapted to make it more interesting. For example, for kickball try running bases backwards, in reverse order, or use balloons instead of a ball. Play games at all physical activity levels remembering that every group and day is different. Have game variations for various personalities and weather conditions as well. Always stop the game while everyone is still having fun, so that campers will want to play the game again. To help build leadership skills, independence, and self-esteem, let some of the campers lead games after you explain the rules. Let them choose captains, set boundaries, and arbitrate arguments. 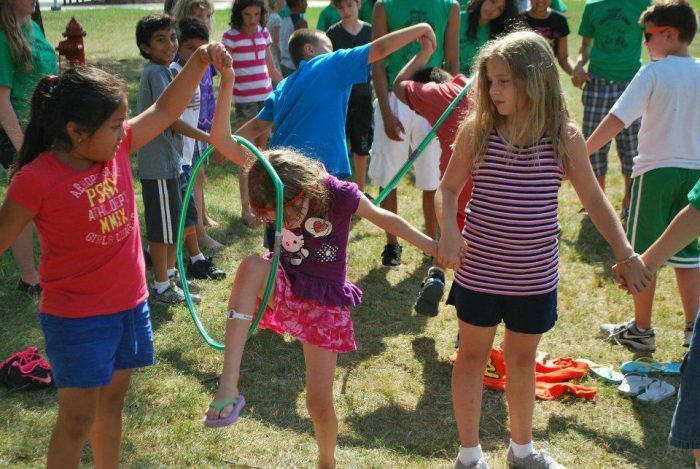 Our selection of camp games includes camp games for kids of every age and ability level. We have active outside games and those played indoors. Some require preparation and equipment and some can be played anytime and anywhere with no prior preparation required. Read on to find the perfect camp game for your summer fun. 6.2 Doggy, Doggy, Where Is Your Bone? 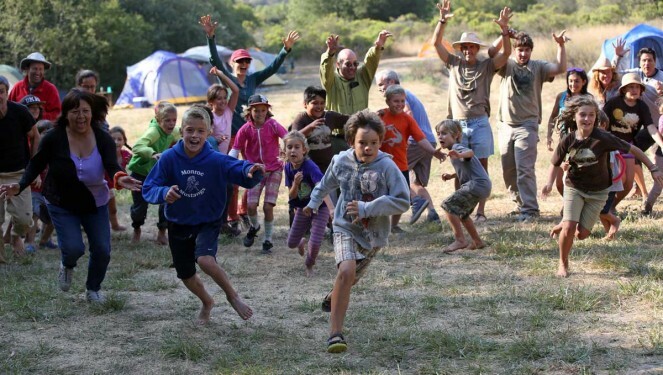 Kids of every age love hide and seek and we have three variations sure to provide fun for your campers. For additional fun, play these games at night. Just make sure you designate an area without any obvious dangers. A fun camping game that works well for ages eight through twelve, the object of this game is to find the hidden counselors. Begin by providing each camper with a pencil and paper. Keep the campers in a specified area until all the counselors hide. After the counselors are hidden, the campers search for them and get signatures from each counselor as they find them. The first camper who gets all the counselor’s signatures wins. Divide your group of campers into the “good” guys and the “bad” guys. The bad guys hide and the good guys find them, arrest them, and bring them to “The Jail,” a predesignated location. When all the bad guys are in jail, the players change places and play starts again. An “opposite” hide-and-seek game, only one person hides. The other players search for the hidden camper and remain hidden with them when they find them. The loser is the player left when all the others have hidden. The loser becomes the next person to hide. Competition between teams creates a great deal of camp fun. The team with the most points wins in each of these games. One of our team camp games works for more than two teams. Set up two rows of chairs approximately three feet apart. (No chairs? No problem. Just have the campers sit in a row on the ground or floor.) Assign each team a basket at one end of the facing rows. Divide your group into two teams and have them sit alternating the players from the two teams. Place a large basket, box, or clean waste container at each end of the facing rows. The object is to bat a balloon down the “court” and score a basket. If a player hits the balloon out of bounds, the leader awards the other team the ball to begin play again. Set either a time for play or a score to be reached for winning. A popular children’s game great for camping, the object of this active game is to capture the other team’s flag. Divide your group into two teams. Designate a play area. Each team hides their flag on one side of the playing area. Teams attempt to find the other team’s flag. 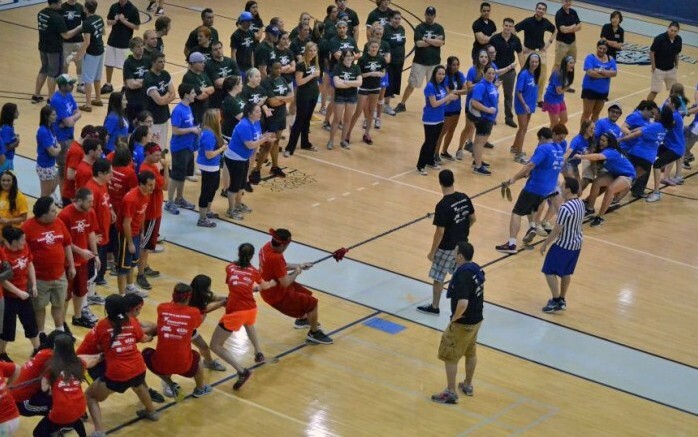 At the same time, team members must keep from being tag by members of the opposing team. If they are tagged, they go to “jail,” a designated area on the opposing team’s side. They only get out of jail if someone on their team manages to get to them without being tagged. The game ends when the time is up or when one team captures the other team’s flag. A type of reverse tag, the object is to be the last person left untagged. Designate one player to be “It,” and begin tagging the other players. Every time a player is tagged, they link arms with those who have already been tagged. As they do so, a blob of players forms. The person left when all the other players have been tagged and become part of the blob is the winner. For this game, you will need a broomstick, cane, or wooden baseball bat. Give a number to each player without players knowing the number of the other players. Have all your players form a circle around a player in the center. The player in the center of the circle holds the cane, baseball bat, or broomstick, and releases it without warning, while calling out a number. The person assigned the called number runs forward and tries to catch the released object before it hits the floor. If the player succeeds, he becomes the person in the center of the circle. Have your campers form a circle and pass a beach ball or lightweight ball. Players can only touch the ball once in a row. If they touch it twice, they are out. If a player is not able to keep the ball in play, they are out. If a player touches the ball and then the ball hits the ground, they sit in the middle of the circle. If a player spikes the ball, and the players in the middle of the circle catch it, the player who spiked the ball sits in the middle of the circle. The object is to be the last person standing. After establishing boundaries for play in a large circle about twenty yards in diameter, throw a single dodgeball in the air. Players must allow the ball to bounce three times, after which any player can grab the ball. Players may only take three steps and then must throw the ball at another player. Anyone hit by the ball is out and must leave the playing field. However, if a player successfully catches a ball thrown at them, the thrower is out. Every time a new player is eliminated, anyone eliminated by them is back in the game. The winner is the player left when everyone else is out. This game can take a very long time. You can shorten it by having those players eliminated permanently out of the game. At the end of the day, campers usually are physically exhausted. Still, campers need evening activities to keep them entertained. Most camps have a pavilion or other outdoor area for gathering at night. The following activities will keep everyone entertained until lights out. Allow the teams 20 minutes to prepare their skits. If you wish, campers can prepare their skits early in the day for performing around the campfire at night. At the end of the auction, the team with the most points wins a prize such as extra time participating in a favorite activity or free ice cream from the camp canteen. The team members line up behind one another on one side of the stage. The facilitator says, “Go!” and starts counting to five. The first team takes the stage and acts out an action appropriate to the chosen location. They have fifteen seconds to do so. Camp leaders or counselors try to guess what action appropriate to the chosen location the team is trying to pantomime. If those guessing are correct, the team goes to the end of the line. If the action cannot be guessed, the team is out and must sit down. Teams keep acting out actions. Teams are not allowed to repeat actions. If they do so, they are out. After all teams have taken a turn, campers choose another location and play continues. Most of the games we have listed work for any age. However, the following two games are especially appropriate for younger children. A fun game to release energy, counselors need to monitor this one closely to ensure safety. Players try to push each other with only their hands touching. Begin by pairing up your campers. Have team members face each other, and place hands on shoulders with arms straight and feet together. When the game begins, players put hands together, palms facing out. Keeping palms touching and feet together, players attempt to get their partner to lose their balance by pushing them with their outstretched arms. Campers must push or not push at just the right time in order to either push their partner over or have their partner lunge forward and fall. The last camper remaining upright wins. Doggy, Doggy, Where Is Your Bone? A guessing game that works for very young children, begin this game with your campers standing or sitting in a circle. You will need a prop to serve as a bone. Choose one camper to play the dog and find the bone. The camper playing the dog closes their eyes (or you can blindfold them). The facilitator of the game chooses a person from the circle to sneak up and steal the bone. When this camper does so, they say in a disguised voice, “Doggy, doggy, where is your bone?” After they return to the circle, all the players stand with their hands behind their backs and the camper playing the dog tries to guess who has the bone. Once they guess correctly, the camper who stole the bone becomes the dog. Summertime is camp time for many children. 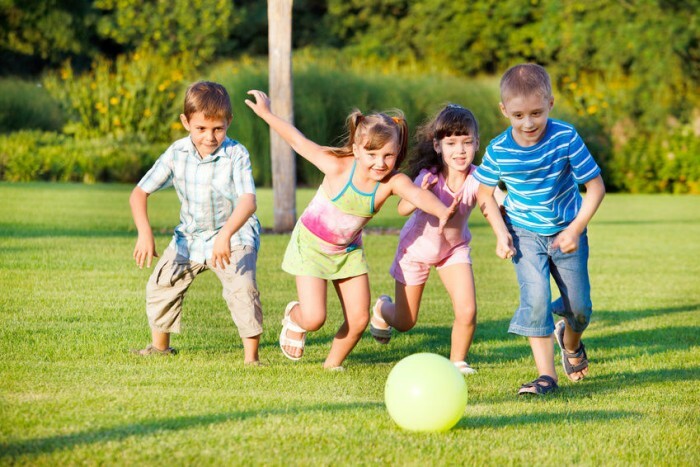 Increase their fun and create lasting memories with our selection of fun camp games for every age. Make sure you choose games where everyone can participate and have fun. Choose games that fit the age and ability level of your campers. Counselors should participate with the campers. Give clear instructions and make sure all participants understand game rules. 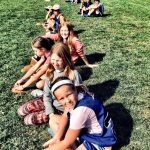 Encourage sportsmanship and discourage name-calling, rough playing, and any other behaviors that may hurt campers physically or emotionally. Younger campers need games that are safe and provide an opportunity for everyone to participate. Additionally, younger campers build valuable skills such as sharing, taking turns, and good sportsmanship while playing. 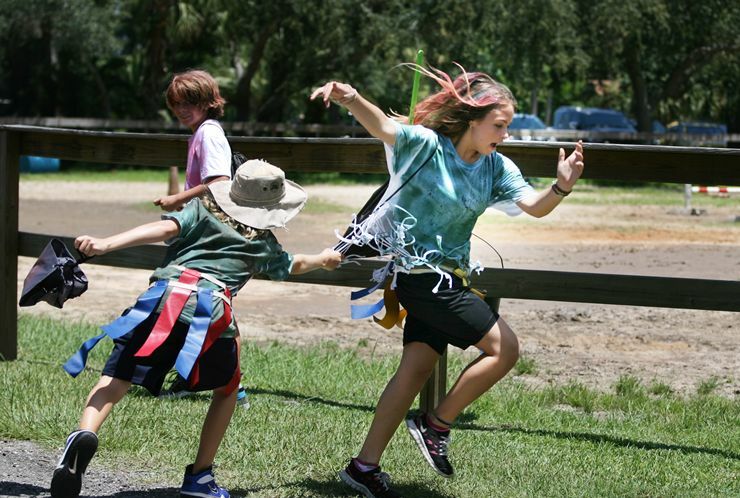 We have chosen games that are fun, but also provide some personal growth for campers. Provide a paper plate for each camper. Place five grapes on each plate and bury them in whipped cream. Players lock their hands behind their backs and attempt to eat all of the grapes on their plates. If you have a great number of campers, have six to eight of them play at once and then have winners in a playoff. Add whatever items will make the bugs feel at home. If you found your bugs under leaves, add some leaves. Add rocks for the bugs to crawl on, if you think they will like them. A twig is a nice addition for some bugs. Just put it in a place where they cannot use it to climb out. Add a small dish of water and some food – a small piece of fruit works well. Remember to set the bugs free the last day of camp. Gather materials for the forts. If possible, build the forts against a support – a fence, large rock, or tree. Level the floor as much as possible. Build your fort, using larger materials on the bottom and work your way up to lighter, smaller materials at the top. If you have rope available, use it to secure the largest pieces. If one group of campers collect a great deal more materials than another, collect all and have groups take turns picking out what they need to build their fort. Fort building is not for everyone. If you have more sedentary campers or very young campers, try making a home for “fairies” or “gnome.” Collect leaves, rocks, sticks, shells, feathers, and any other items that are small and pretty. Your home should be hidden under a bush or behind rocks to provide fairies or gnomes the privacy they like. Try this game with very young campers in grades two and up. Players must find objects around camp that begin with each letter of the alphabet. The names of objects must be specific. For example, “tree” will not work, but “pine” will. This game can also be played with teams. Choosing camp games for teenagers can prove challenging, but if you stick to active games, boredom will be avoided. The following games provide laughter and a bit of a challenge. Divide your campers into pairs and provide each couple with an inflated balloon. The goal is to pop the balloon between their bodies without using hands or feet. It may be best to pair boys with boys and girls with girls to avoid embarrassment. The last pair with their balloon still intake wins. Choose a wooded area for this game. Establish a basepoint, and divide the campers into two teams. Provide the first team with something to leave a trail – popcorn or small pieces of paper work well. (The paper must be picked up, however.) The first team sets off into the woods to set up an ambush point. If you do not want to use clues, have them stick to an established trail. The second team waits for five minutes and then sets off to find the first team. When they arrive at the ambush spot, the first team’s members jump out and try to tag all of the members of the second team before they can return to base. Those who are tagged join the first team. When everyone is back at the basepoint, campers switch sides, with team two doing the ambushing. Eventually, all the players should be on the first team. The last player remaining untagged wins. Gather your teen campers into a circle so that all players can see each other clearly. Have everyone put their heads down and close their eyes while a counselor counts to ten. When the time is up, campers look up and stare at someone. If the person they are staring at is staring back at them, they both let out a loud yell and leave the circle. Those who are not staring at someone who is looking back at them remain in the game. The last two people in the circle win. Instead of having those with shared stares yell, have them call out their names before leaving the circle. This is a good way to help campers learn each other’s names. Some games work no matter what the age and skill level of your campers. This set of games works well at a camp with a wide span of ages. An obstacle course provides a skill challenge for kids. If you wish and have space, you can leave the obstacle course set up for a number of days or for the entire camp session, and campers can attempt to improve their skills and score. You can even include some items to keep the camp area clean and neat. 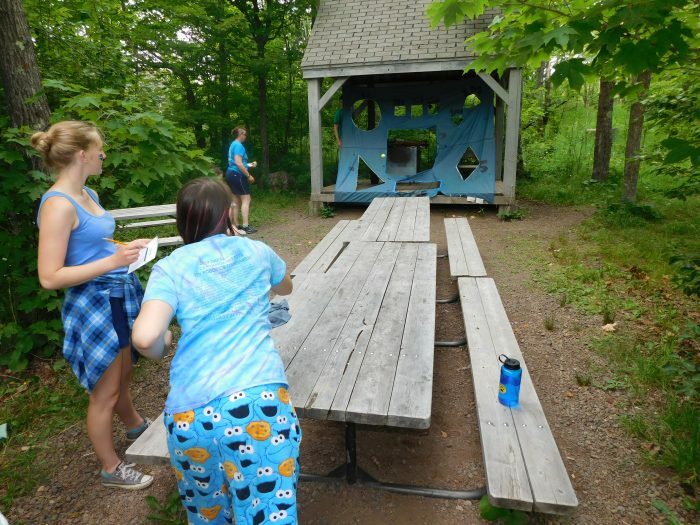 Try two different types of scavenger hunts with your campers: 1) take a nature walk and provide a list for campers to check off as they find items, and 2) create a scavenger hunt with parameters for the camp area. The list of items to find varies, but the fun your campers have is guaranteed, no matter which option you choose. It is a good idea to have campers work in pairs or teams if you have a very large group. Counselors should verify finds before campers check items off their list. All campers will love camp Olympics if you include a variety of skills and allow campers to make a selection based upon ability. A good way to do this is to divide your activities into sets and let campers pick from each set. Give points for the more difficult skills in each set and decide upon the total points necessary for completion for each camper. If you do not have the campers compete for the highest score, the activity becomes one in which a camper is able to excel and feel good about their accomplishment. Hide and Seek is so much more fun at camp than it is at home, because there are so many places to hide. A nighttime game is particularly fun. Provide a flashlight for whoever is “It.” You may wish to set as specific area for your game or some hiders may never be found! Fun for a particularly hot day, a water balloon fight gets everyone cool and wet. Simply fill balloons with water. Campers can either play alone, or divide your camper into teams and provide each with filled balloons. Whichever team has the driest members when the balloons are all dry wins. Alternatively, if campers are playing as singles, whoever stays dry until the balloons are gone wins the game. What would camp be without a campfire? 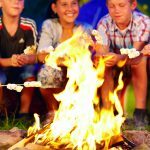 The following activities help make the time around the campfire fun and full of memories. Your camp counselors should be able to provide some good stories. Scary ones are fun. Once the counselors have shared, get the kids to make up some stories or tell an old one with a new twist, i.e. Hansel and Gretel where the old woman is nice. When everyone who wishes to participate is through, have the counselors vote on the best kid’s story. Remember, kids love hearing about the “old days” when the adults were their age. Each camper adds a sentence until the story ends. If the stories are short, encourage the telling of more than one. 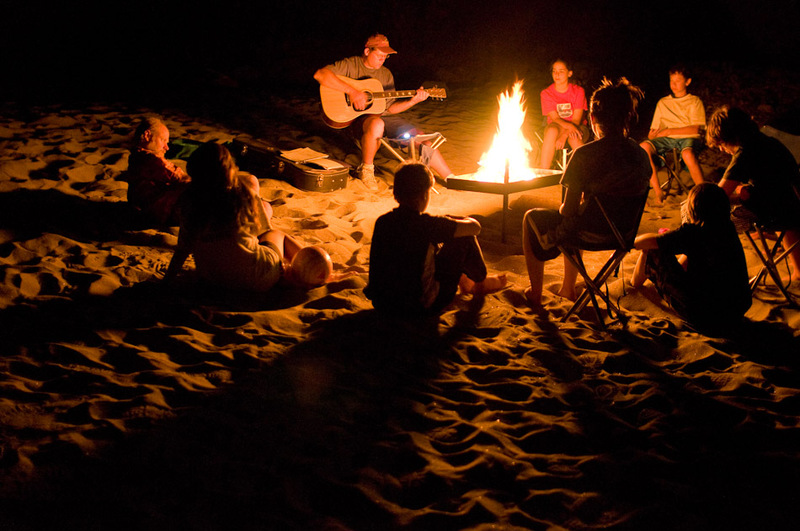 If your campers do not know many of the traditional campfire songs, you may need to teach them. Try easy things at first, such as “Row, Row, Row Your Boat” as a round, with singers joining in after each line is sung. For extra fun, add “instruments” such as a can filled with pebbles, pot lids, and “drum sticks” (a long handled spoon) and pans. If the rain is warm and there is no thunder and lightning, play in the rain. When the weather is warm and kids are out of school, it is time for camp, and nothing makes camp more fun than good games. Be prepared with camp games for sunny and stormy days and nighttime as well. 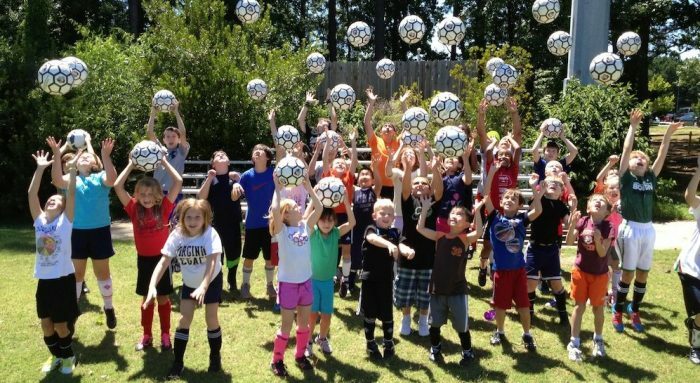 Use the games in this article for every camp situation, age group, and level of ability. Pick a camp game and have fun!